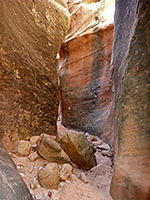 The red and white Navajo sandstone of Zion National Park is exposed at various other locations nearby, and here too are found narrow canyons, less spectacular than those in the park since they are generally shorter, shallower and not containing running water, but still enclosed, colorful and photogenic. The westernmost area, also right at the western edge of the Colorado Plateau, is across the southern slopes of the Pine Valley Mountains, north of St George and about 25 miles west of Zion. The mountains are a volcanic intrusion of relatively recent origin, pushed up through the overlying sedimentary rocks and elevating them above the corresponding flat layers further east. 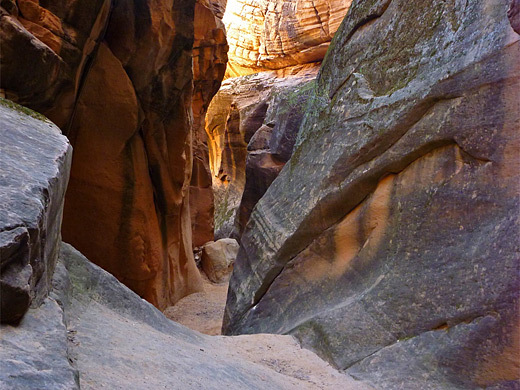 The mountain slopes have a wide, red band lower down, seen for example in Red Cliffs Recreation Area, and a narrower white band below, known as the White Reef, or Silver Reef on account of a small amount of silver ore that was discovered here in the 1860s. 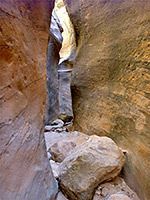 Several seasonal drainages flowing down the mountains have eroded short slots as they cross the steepest section of the hillside - around 4,200 feet, close to the upper edge of the sandstone, and the most visited is Yankee Doodle Hollow, which downstream eventually joins Quail Creek, at the north the end of its reservoir. 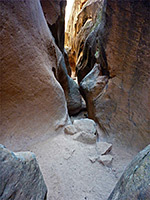 The drainage is deep for a couple of miles of which just a quarter of a mile is a slot canyon, and although this starts with a big drop, of 70 feet, most can be seen without need for any equipment by hiking up from below, a relatively strenuous hike that involves upclimbing several dryfalls and chokestones in the range 10 to 15 feet. Despite being rather short, there are some quite pretty passageways, not often directly illuminated by the sun due to depth and orientation, but deep enough for good colors and shadowy patterns. 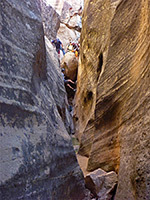 Due in part to the lack of NPS regulations, and the proximity to Interstate 15, the ravine has become popular with canyoneering groups in recent years, including the Zion Adventure Company, and is a good place to learn or practice rappelling techniques. Yankee Doodle Hollow is accessed from FR031, a 25 mile route linking Leeds with St George; the canyon is 9 miles from Leeds. The road surface is generally good for this eastern section, but beyond it starts to deteriorate and the western approach from St George may need 4WD. 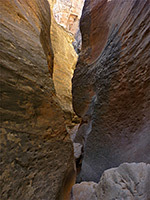 People rappelling park just above the slot, near where drainage crosses the road, while for hikers, a suitable parking place is a few hundred feet back, at the wide verge where the road makes a tight bend, this close to the western rim of Big Hollow, a larger ravine of which Yankee Doodle is a tributary. 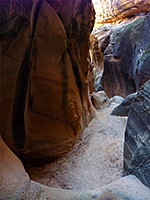 A recognizable trail, also the exit route if descending the slot from above, leads west from the parking spot, across to the canyon rim and down a little ravine, reaching the floor a short distance west of the Big Hollow junction. 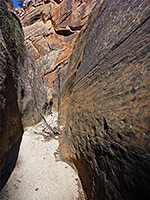 The ravine is steep, and the lower part is surrounded by smooth slickrock, but there are no particularly difficult places. 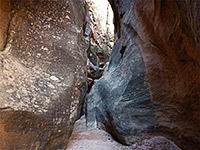 Like Big Hollow, Yankee Doodle Hollow at this point is around 200 feet deep, and enclosed by near-vertical walls, with pebbles and boulders in the creek bed. There are no slots downstream. 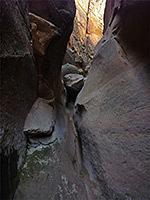 Upstream, Yankee Doodle Hollow contains one obstacle quite soon, a boulder passed by climbing up the right side, with the aid of a few footholds carved in the rock. The drainage stays fairly open for a little while and then narrows, forming some quite dark passageways, lined by smooth reddish walls. A succession of chokestones above sheer drops or sloping falls partially block the channel, but with effort all or most can be climbed. A few places are quite dark, since although the rocks do not overhang above, the cliffs are vertical, the red sandstone stained black or grey. Some of the chokestones have belay points above, and seasonal pools below, generally just one or two feet deep. The last few falls are taller, up to 25 feet, shortly before the fluted, 70 foot drop close to the upper end of the slot. The round trip to the first of the bigger falls takes just an hour or so.